Tankformers’ Eli Evans and Ben Searcy have made it two in a row, winning today’s Netier National Capital Rally and claiming their second round of the 2018 CAMS Australian Rally Championship. Evans led from start to finish in Canberra, extending Saturday’s 46 second lead to win by almost five minutes after 241 competitive kilometres. Evans’ Skoda Fabia R5 outlasted the rough Canberra roads as he held off challenges from Toyota Genuine Parts’ Harry Bates and Contel Communications’ Steve Glenney. Bates and co-driver John McCarthy were the only team to challenge Evans for outright pace throughout the event. The rivals shared stage wins over the two days, Evans claiming nine stages and Bates taking out six. Bates won Sunday’s battle by ten seconds but could not claw back the time he lost with a blown turbo in the Yaris AP4 yesterday. Contel Communications’ Steve Glenney and Andy Sarandis were sitting pretty in second for much of the event until they too blew a turbo in the second last stage of the event. Glenney was forced to nurse the Subaru WRX STi through the final 18-kilometre stage and slipped to third outright. Yes! Optus’ Adrian Coppin and Glen Weston capitalised on Glenney’s mechanical issues, posting a solid performance throughout the day to grab second position and a swag of championship points. Asia Pacific Rally Championship competitor Yuya Sumiyama and Takahiro Yasui finished in fourth and Bates and McCarthy rounded out the top five. Evans was understandably pleased with the result. “We’re stoked. It was a tough weekend and we had some really good competition from Steve Glenney and Harry Bates, both the guys had car troubles over the weekend, one each day, took a little bit of stress off us,” Evans said. 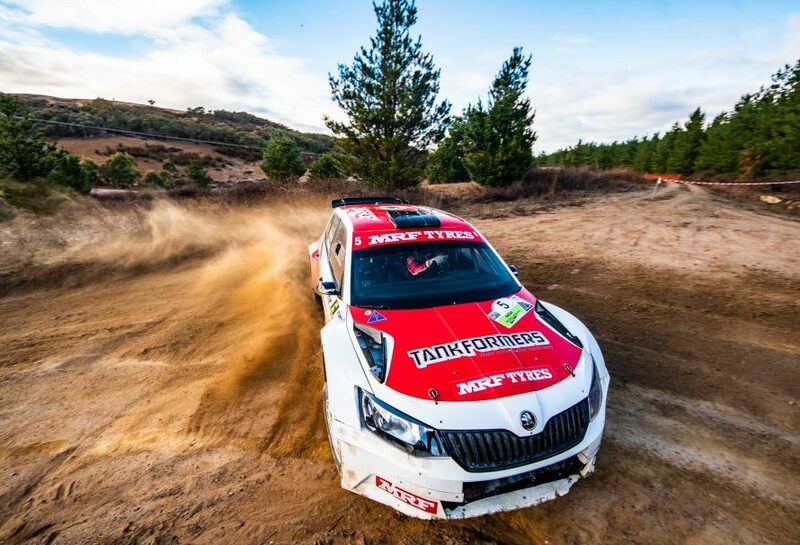 “The Skoda R5 was fantastic, MRF tyres were excellent in these conditions, so rocky and abrasive on day one and dusty and loose on day two, but I had the confidence to drive as fast as I can. “Harry was going to be fast here, we knew that and he was, and Steve, I think probably drive of the event maybe. We won but Steve in a production car did an exceptional job… he’s keeping up and putting the pressure on us all the time. “It’s exciting, it’s great and if you back off for a couple of corners you will finish fourth, fifth on stage so it’s fantastic,” Evans said of the competition in the 2018 ARC. Coppin welcomed today’s podium finish but felt for Glenney. “It’s bitter sweet – obviously we are happy to get a second place,” said Coppin. “I think we drove a smart rally all weekend. The pace wasn’t there but I’ve done this rally a few times now and I know it’s a tough one and you have to get to the end. Commiserations for Steve but we have come away with second which is nice. Coppin paid tribute to co-driver Glen Weston, who stepped in for the ill Erin Kelly at the last minute. Glenney, while disappointed to have missed second outright, recognised that it was outside of his control. “We came up over a crest towards the end of Sherwood and just had no power, or 10 per cent power. But that’s the way it goes, that’s rallying,” Glenney explained. Next stop for the CAMS ARC is the Subaru Rally Tasmania on 27-29 July, as teams prepare for a new challenge in the country’s southern-most state.